Week 5 was a complete opposite of last week, seeing little to no major injuries hit the NFL. But there are still plenty of opportunities for players thanks to bye weeks. The Bears and Buccaneers are coming off their bye weeks, so you may want to look for some players from those teams to replace your starters from the Lions and Saints. Let's dive into some players to target this week. If you didn't listen last week, you may have another chance to grab one of the best players on the waiver wires. Keke Coutee had another good day for the Texans, catching 6 of 7 targets for 51 yards and 1 touchdown. Coutee and QB Deshaun Watson have seemed to develop some chemistry, which is unfortunate for Will Fuller (only 3 targets). Coutee will have big games ahead, especially with the run game struggling. When WR DeAndre Hopkins gets double coverage, look for Coutee to really shine. He needs to be added in all leagues. Need a volume based RB this week to replace an injured starter or Alvin Kamara? Alfred Morris is your man. Starting RB Matt Breida went down with an ankle sprain in Week 5, meaning Morris should see a majority of the carries on Monday night against the Packers. Morris carried the ball 18 times for 61 yards and caught 3 of 5 targets for 30 yards. The Packers weren't killed by the Lions' run game in Week 5, but they aren't anything to worry about either. Morris should get plenty of opportunities for a solid game in prime time. He should be added this week in all leagues. Apparently the Seattle Seahawks have become a running team. The Seahawks rushed 32 times in a tough loss to the Rams. Now that may be due to game plan, but it seemed to almost work. Davis carried the ball 16 times for 68 yards and 1 touchdown. He also caught 2 passes for 7 yards. It looks like this has become a two-headed monster with Chris Carson getting a majority of the carries. Rookie RB Rashaad Penny never touched the ball. Davis travels to London to take on the Oakland Raiders (who got gashed by Gordon and Ekeler this week). He can be added in 12-14 team leagues if you need a RB this week. This is just your friendly reminder to not forget about Taylor Gabriel, who before his Week 5 bye had 7 catches for 104 yards and 2 touchdowns. He has been one of the most targeted players in the Bears' offense. Gabriel gets Miami and New England in the next two weeks, and both of those defenses can be beaten through the air. Gabriel can be added in 12 team leagues, but should be added 14 team leagues. So I was wrong about the Tyler Kroft pick. It seems like the Bengals have decided that C.J. Uzomah will take over the Tyler Eifert role. Hopefully you weren't burned too badly. Uzomah was only targeted 2 times this past week, but caught them both for 43 yards. With Kroft leaving the game early with a foot injury, Uzomah should get even more work. The Bengals also get a ton of easy defenses in the next few weeks, including Pittsburgh, Kansas City, Tampa Bay, and New Orleans. Uzomah should be added if you are desperate at TE. Cameron Brate has always been QB Jameis Winston's go to TE, and that should continue this week when the Buccaneers travel to Atlanta. Atlanta's defense has been abysmal, so Brate has a great opportunity for some touchdowns. Brate has a touchdown in each of his last two games, making him an intriguing TE pickup. If you've been watching the Texans' run game, you probably already know why D'Onta Foreman made this list. Foreman looked great at the end of last year before tearing his Achilles. 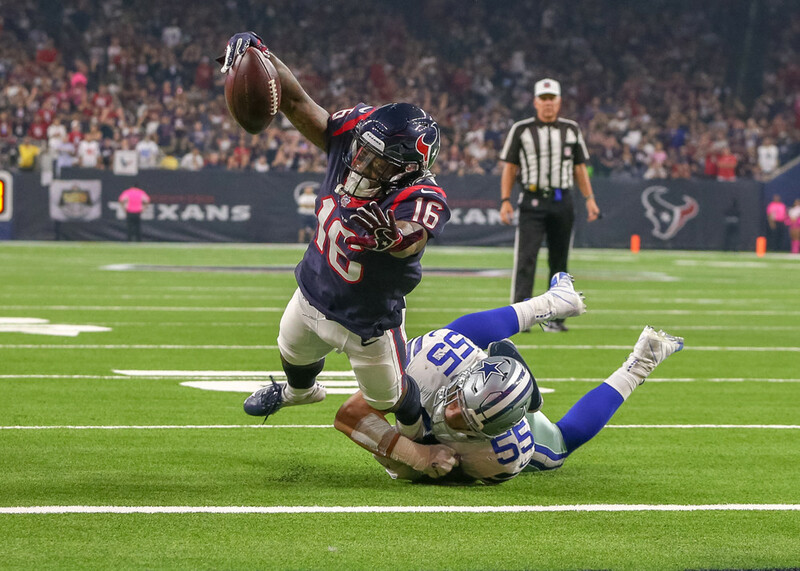 RB Lamar Miller and Alfred Blue have looked slow and just downright awful at times, and this offense needs a run game for QB DeShaun Watson to be great. Foreman is eligible to return in Week 7, so he is a solid stash heading into the 2nd half of the fantasy season. QB Jameis Winston is also coming off a Bye this week, but gets a halfway decent schedule the rest of the season. As I said last week, Winston is on a team that will have to throw a ton to keep up with opposing offenses destroying the Buccaneer defense. He may toss a few interceptions, but his yardage and touchdowns will make up for it. Winston has the weapons and the opportunity to be a top 10 QB.